Andrea Bocelli & Wife Surprise Audience With Beautiful Love Song Duet. “Does it get any more romantic than two people in love singing to each other?” That’s the question that was posed in the video below, and after watching it, we’d be hard-pressed to find something that one-ups it. 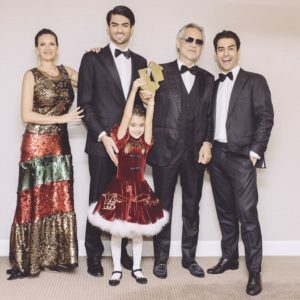 Andrea Bocelli and his wife Veronic Berti have only been married since 2014, but it’s clear from their impromptu duet below that their love is strong and true. They’re just as smitten with one another as the first day they met. When Andrea was putting the album together, the producers wanted somebody to demo “Qualche Stupido” (Something Stupid), so of course, Andrea volunteered his “beautiful love.” Veronica is also his manager, but as it so happens, she has a pretty knock-out voice, too! When this special Portofino concert was being put together, the producers and presenter said, “we loved [the demo] so much that we begged her to do it with Andrea tonight.” He followed it up with the question we started with: Does it get any more romantic than two people in love singing to one another? Judging by this heartfelt and passionate performance, we have to say a resounding no! Andrea and Veronica are a force to be reckoned with in this beautiful duet. Watch them sing to one another in a setting that’s almost as elegant as the performers themselves. Share to spread their talent!